Previous post: Hats – which one are you wearing? Next post: The Wait ~ now the surprise. Let’s not get ahead of ourselves just yet!! This is not about me being out of home and partying hard; this is about yet another day @ work. Last 16 months, I have lived and breathed about another sport NASCAR. I was and am the one of the Architects on a project that Sapient Nitro embarked upon sometime in 2011. 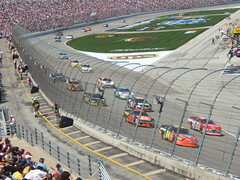 We worked with NASCAR – the 2nd most popular sport in USA and we had to re-platform their .com digital property. I was responsible for technology design and implementation on the project. During the course of the project and especially after it went live on Jan 3, 2013, we had to also support the races. Today is one such race day/weekend when NASCAR holds it 9th round of the Sprint-cup-series. I am in office; I didn’t need to be, but we have our Delivery Lead (John Schneider) visiting India first time since launch and he will be in office tonight experience first hand a night out on support. I am in office just to make sure that we don’t end up sharing a superficial experience with John. Out of the 9 races that we have had, I have been in office during weekends and nights for at least 5 weekends and as we have stabilised the platform week on week we have had our share of fun with Fantasy, Raceview, Leaderboard and Live Telecast (if we can find one). And, i want to make sure that we do all of that today as well and not just put up a grandeur show of working and working. of running this beast of a platform day in and day out. They are the warriors who hold up the gates while several million fans enjoy the sport out there. The team is in middle of ensuring that the pre-flight checks are done and things are working as they are supposed to. We will check several systems – Feeds for leader board, feeds for lap by lap commentary and cautions, editorial publishing which is used to push all major content, check that all the servers – web and CQ publish servers are in order and the content is in sync with each other. NASCAR’s editorial team is already on ground and the press passes are starting on; I can see updates coming on home page. Today, we will have Matt Kensth lead the field – he was the winner last week as well so a strong start for him. They have already pushed a couple of home page updates. I can see the Home Page hero saying “Ready for Richmond” with a nice picture of a driver that I cant identify – but looks like it is Kenseth. We have the projects up and running – one of them will be projecting the real time analytics telling us the traffic levels on the site and another one that will stream the race directly for us. Three of us – Nitin Tyagi, Kiran and me play fantasy very aggressively and are competing very closely. We all have our teams set and here is a snapshot of my team today. Leaderboard is not warm yet but this is how it looks today and something that the team is monitoring very closely. This is the page that gets so much traffic today during races. Looking for a good day @ office – Oops!! for another good night out! !